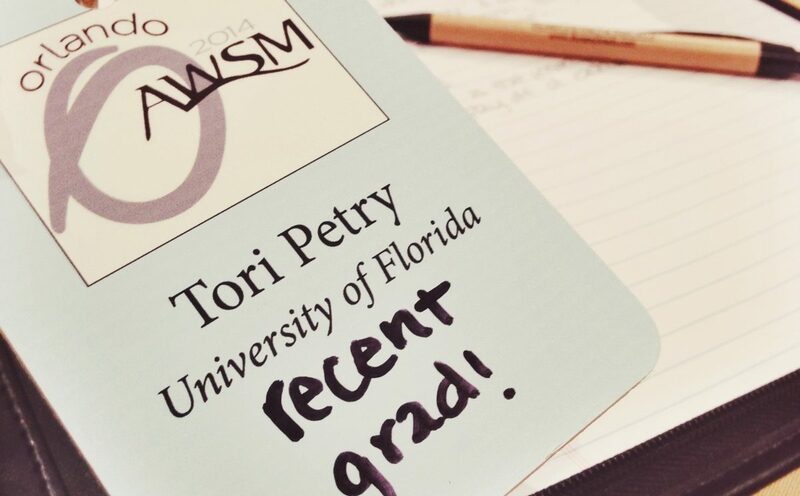 When I applied for the internship, I didn’t know much about the Association for Women in Sports Media, affectionately called AWSM (pronounced “awesome”) by its members for short. But that summer, I not only got the chance to gain incredible experience working at the “Worldwide Leader in Sports,” but I also walked away from the 2012 AWSM convention with a whole new perspective on the roles the women before me have played in sports media and on my own potential to make an impact for women after me in the industry. 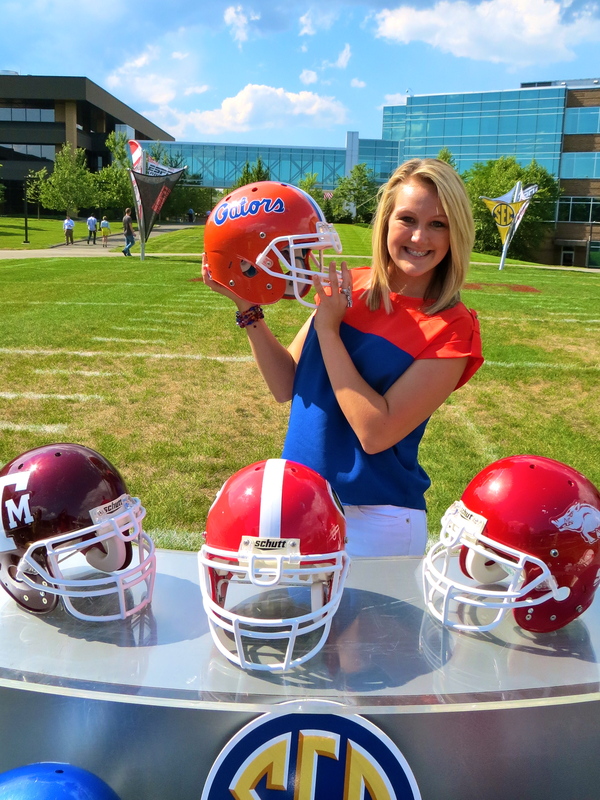 As a young college student, I began to realize that I wasn’t limited to aspiring ONLY to become a sideline reporter as a woman in sports television, and that as cliche as it sounds, I was the only one who could put limits on my dreams. “Empowered” is really the best word I can think of to describe the feeling of walking away from an AWSM convention, and the the same feeling was true after leaving the 2014 convention in Orlando this past weekend. As always, it was wonderful to spend time with the network of women (and men!) that are committed to making sure that women are the best they can be in their fields – and not just the best women in their fields. New York Times reporter Juliet Macur shared stories of how people in her career have accused her of having an affair with an athlete or other source in order to get her stories. “As a woman, the better you are, the more people are going to try to criticize you,” Macur said. Despite these setbacks, the panel shared years of experience and advice on how to gain trust with your sources. “Whoever knows people and gets people to trust them, that’s who gets the stories,” Kaufman said. “Aim for conversations, not interviews,” Macur added. Having fun with some AWSM members on Friday’s trip to Disney. 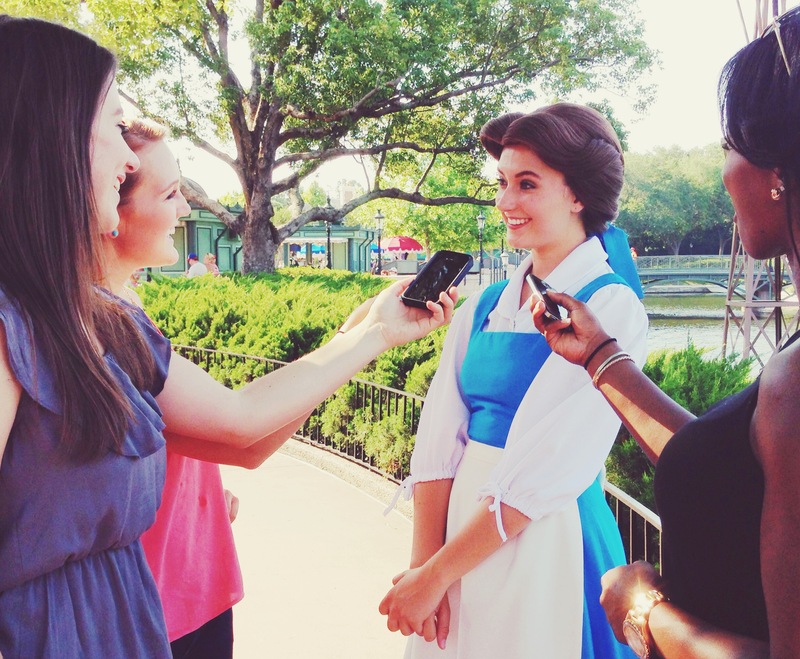 Doing an “interview” with Belle! One of the sources sports reporters have to deal with the most is coaches. Saturday’s lunch speaker perfectly complemented Friday’s session on sources, and as it turned out, my favorite speaker of the AWSM convention was ironically not a woman, but the newest coach of the Detroit Pistons, Stan Van Gundy. Van Gundy spoke Saturday on coach/media relations and provided invaluable insight on what reporters can do better to develop relationships with some of their most important sources. He opened his talk with a quote from Charlotte Whitton he said he has often shared with his daughters: “Whatever women do, they must do twice as well as men to be thought half as good. Luckily, this is not difficult.” Though this quote was both humorous and all too true for many women in the room, his talk was a very blunt and honest look at how he felt reporters – both men and women – can improve in their dealings with coaches. Van Gundy talked about how coaches take notice of how prepared a reporter is coming in to an interview and how important entering with confidence can be. “Preparation breeds confidence,” he said, a notion that can be applied to so many walks of life outside of interviewing sports figures. He also noted that looking for and/or trying to create drama and negativity within the team is never a good way to stay in good graces with a coach, and that reporters should cover all aspects of sports with objectivity – negative situations included. My favorite take-away from Van Gundy’s talk, however, was what he had to say on the topic of criticizing and taking criticism. He observed that while journalists are often the first to condemn coaches’ actions and behavior, they tend to be too sensitive when a coach calls them out for getting facts wrong. He advised that you shouldn’t be afraid to admit fault if you deserve it, but also that the prospect of a coach getting upset with you shouldn’t sway you from asking hard questions. I especially appreciated this advice after dealing with one particular coach from the University of Florida (I wonder who?) that tends to be quite touchy with questions he doesn’t like from the media. It was fantastic to hear straight from Van Gundy, a coach who has taken quite a bit of criticism through the years, that most coaches understand they deserve fair scrutiny and that it is just part of the job description. Whether their reaction to hard questions reflects that or not, that shouldn’t deter me from my responsibility as a sports journalist. The confidence that came out of these discussions is something that is tough to find anywhere else. And of course, talking with legendary trailblazers for women in sports like USA Today’s Christine Brennan and Mary Garber Pioneer Award winners and AWSM founders Nancy Cooney and Susan Fornoff does a lot to inspire you as well! Just like in 2012, I have walked away from this weekend’s convention empowered to be a part of trailblazing for women in the 21st century. Susan Fornoff pointed out in her award acceptance speech that women today are just as much pioneers as she was: although 47% of NFL fans and 45% of MLB fans are women, only about 10% of sports newsrooms are women today. In television, where are our female analysts? 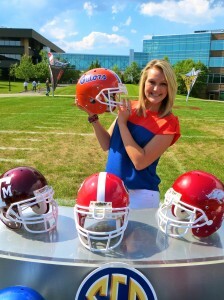 Why do young girls think sideline reporting is the only option they have if they want to cover sports on television? For as much progress as these ladies have made for us already, there is that much more progress to be made. As I move forward into my career, I aim to continue to carry the torch of earning and gaining respect for women in sports media. If you’d like to join me in promoting women in this field, I highly encourage you – both men and women! – to join AWSM. I’d be happy to talk to you about it more, but I promise you now you won’t regret it. For as long as my career lasts, I know I for one will not stop trying to exemplify the ideals of this incredible organization.